A good putting stroke is often described as having a pendulum-like pace. Making an even, flowing motion, back and through, is key to controlling your distance and direction on the greens. It sounds easy, but proves difficult for many golfers. Some have short, jabbing strokes, while others yank the putter back quickly and decelerate on the through-swing. Still others make an overly long backstroke, forcing them to decelerate before contact. Place a quarter lying flat in the back of a cavity-back putter and hit a series of putts from 3-10 feet. The goal is to keep the quarter from falling out as you transition from the backstroke to the through-stroke. The resulting even tempo will keep the putter on path. Turn your putter sideways so that the tip of the toe contacts the ball. In order to strike the ball solidly with the smaller hitting area, you must make a smooth, controlled stroke. Practice for a few minutes, then resume putting normally with the same pace -- you'll find it much easier to hit the sweet spot. You certainly don't need anyone to tell you just how important putting is to your overall score at the end of the day. As a golfer, you already understand that it is critical to make as many putts as possible during a given round. It is great to hit beautiful drives and accurate approach shots, but all of those accomplishments will be wasted if you miss too many putts. Putting can be incredibly frustrating or incredibly rewarding, depending on whether or not the ball is willing to fall into the hole for you. Many golfers reduce their success or failure on the greens to the whims of luck – they think that some days the putts are going to go in, while other days they will stay out. Of course, it doesn't work like that at all. 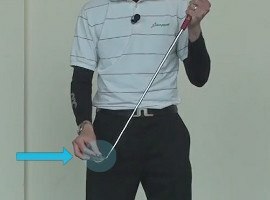 If you are willing to work hard to refine your putting technique, you can see improved results on a day in, day out basis. Putting isn't about luck – it is about making a good read, and combining that read with a great stroke to knock the ball right into the middle of the cup. One of the key elements to putting technique is tempo. Just as is the case in the full swing, you need good tempo in your putting stroke if you are going to be able to make your fair share of putts on a regular basis. Since speed control is such a crucial part of the putting equation, it is no surprise that tempo is critical – after all, tempo and speed control are closely linked. Use the same smooth, rhythmic stroke time after time on the greens and you will find that your ability to roll the ball the proper distance improves quickly. Players who have a hitch or hesitation in their putting stroke will always struggle to hit the ball the right speed, and they will have trouble getting it on line as well. It isn't necessarily easy to build a smooth, even putting tempo, but doing so can pay off in a big way in the long run. In the content below, we are going to look at some putting drills that will help you refine your tempo. Of course, in order for these drills to work, you actually have to use them on a regular basis. One of the leading 'sins' of the average golfer is simply failing to practice the short game consistently. You can't really expect to improve your performance over time if you never practice, so make short game practice a priority during each of your visits to the course. You can be sure that professional golfers dedicate a large amount of their practice time to the short game, and you should follow their lead if you would like to lower your scores. Put the putting drills included below into practice as often as possible and your stroke will get better in short order. The first drill that we are going to highlight in an effort to help you iron out your putting tempo is the one handed drill. This drill is about as simple as it gets – you are just going to roll some putts with each of your hands, one at a time. By taking one hand off of the putter, you are going to have to engage your shoulders actively in the stroke in order to move the club back and through the ball. Using your shoulders is the whole idea behind the putting stroke in the first place, so this is a great drill to get you on track in a number of ways. To start, set yourself up on the practice putting green with a putt of somewhere between 20 or 30 feet. You want to be far enough away to allow you to make a relatively big stroke, but you don't want to be so far away that you have to strain to reach the hole with the putt. Once you pick a spot and a target, begin by rolling a few putts toward the hole with just your left hand. While hitting your putts left handed, focus on the back of your left wrist – it should remain steady and stable throughout the stroke. It is common for golfers to break down in the back of the left wrist, which can lead to a number of negative outcomes. Hold the back of that left wrist as flat as possible through impact and allow the rocking motion of your shoulders to power the club through the ball. 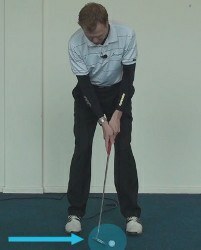 Once you have hit a few putts with just your left hand, switch over and start to hit putts with your right hand only. During this half of the drill, you are going to need to be careful to avoid releasing your club through impact. It is natural to want to release the club at impact just as you would on a full shot, but that isn't how it works when putting. Just as you did with the left hand, you want to keep your hand and wrist out of the stroke while your shoulders do the work. At first, you might find it difficult to make solid contact when you make this kind of stroke. However, with some practice you should get better and better at hitting the middle of the putter face, as long as you are able to hold the rest of your body still during the stroke. Specifically, make sure your lower body remains as steady as possible while you are swinging the putter. Feel free to hit as many putts as you would like while doing this drill. In fact, you may want to make this drill part of your regular warm up routine before every round. By hitting a few putts with each hand individually, you will be able to get a good feel for the rhythm and tempo of your stroke before you put them both back on the club. In addition to helping you establish a nice tempo in your stroke, this drill is great for improving the stability of your body from address through to the finish. You won't be able to roll the ball properly if you are moving all around, so your putting stroke is likely to improve from both a stability and rhythm perspective when you spend some time with the one handed drill. This is a drill that is a take-off of a popular full swing drill that can help you to iron out your rhythm nicely. In the full swing version, you count to four to mark different points of your swing – and as long as you are able to keep the counting even from number to number, you will know that your rhythm is relatively on track. In this putting version of the drill, you are still going to count to four, and you are still going to work to keep your counting as consistent as you can. By working through your stroke in the manner below while counting to four, you will have a good idea that you are nicely in rhythm. For this drill, you are going to want to find a putt on the practice green that is around ten feet in length. In addition to being around ten feet, this putt should also be mostly flat from the ball to the hole. You want to be able to simply focus in on your stroke at this point, so you should have to worry about dealing with any significant breaks for now. Place a ball down on the green and take your stance as usual. It is important that you get into your regular stance, so don't rush through this point. Your address position when you putt is just as important as it is when you are hitting a full shot, as a good stance is much more likely to lead to a satisfactory outcome. When you are ready to start your putting stroke, move the putter back away from the ball just as you would with any other putt. However, as soon as the putter moves, you are going to out count out the number 'one'. If you have the practice green to yourself, feel free to count out loud. However, if there are others around trying to focus on their own practice, you might want to count in your head. The next number will be counted when you transition from backstroke to forward stroke. When the putter changes directions, count 'two' and move on with the rest of the stroke. At impact, you are going to count 'three'. Remember, this should still be a normal putting stroke in terms of the rest of your fundamentals, so don't come out of your usual routine simply because you are working on this drill. Keeping your head down, maintaining a light grip pressure, and holding your lower body steady are important points on these putts, just as they are on any other putts you hit. The final count will come when your putter comes to a stop. As you bring the stroke to a halt, count 'four' and consider the drill complete. Of course, you can now look up and see if your ball is heading toward the cup as you intended. Go ahead and repeat as many repetitions of this drill as you would like before going back to other putting practice routines. Do your best to make your counting from one to four as even and smooth as possible. If you feel like you are having to rush to count out one of the numbers, adjust the tempo of your stroke as necessary to iron out those rough patches. You shouldn't be satisfied with your progress until you are able to count out 1-2-3-4 in an even tempo time after time. Counting out the various checkpoints within your putting stroke will help you to find a great tempo that you can rely on even when the pressure is on. One of the reasons that it is so important to iron out a good putting tempo is the fact that your stroke will break down under pressure if you don't have a solid rhythm in place. Using this drill to work out your tempo and you can have confidence that your stroke is going to be up to the task of knocking in even tough putts under pressure. This is another drill that is extremely simple but also highly effective. In this drill, you aren't going to make any alterations at all to your stroke – you are simply going to putt back and forth across the length of the green. You have to use great tempo in order to control your distance from long range, so one of the best ways to improve that tempo is to hit long putts over and over again. Most golfers spend the majority of their short game practice time working on short putts, as those are the ones that are frustrating to miss during a round. While there is nothing wrong with spending some time on your short putts, that kind of practice won't do much of anything for your putting tempo. So, with that in mind, be sure to save some of your time for long putts in an effort to get your rhythm ironed out nicely. On these putts, you aren't actually going to aim for a hole at all – instead, you are going to aim for the fringe. While standing on one side of the putting green, pick out a section of fringe on the other side to aim for and make your best stroke (obviously you will need to find a stretch of green where you can putt without bothering others). The goal is simple – to roll the ball as close to the fringe as possible without actually putting the ball off the green. If you can get within a few feet, you have done pretty well. If you can get within a foot or less, you have done extremely well. Try not to think too much about the mechanics of your stroke while working on this drill. Instead, just try to feel the rhythm of the putter swinging back and through as you make long strokes which send the ball all the way across the green. This drill is going to be surprisingly difficult at first, but it is sure to get easier with practice as your tempo improves. It is often easier to remain focused on a drill if you have some sort of competitive aspect to it – especially if you can compete against a friend. This is a great drill for that purpose, as it is easy to add a scoring system in order to make this a drill that will bring out your competitive side. While you are free to put together any kind of scoring system that you wish, the following points outline one option for how you can keep score. Each player hits three putts per 'round'. Since you are going to be walking all the way across the green and back each time, it wouldn't really make sense to only hit one putt each. Putting three times each before you walk to the other side is a good way to squeeze in more practice reps.
For every putt that you place within a putter length of the fringe, you get to add one point to your score. For every putt that stops within a grip length of the fringe, you get to add three points to your score. If you knock the ball off the green and onto the fringe, you have to subtract one point from your score. If you hit the putt so hard that it rolls through the fringe and into the rough (or the parking lot), you will need to take a full three putts from your score. If your putt comes up short of getting within one putter length of the fringe, but it stays on the green, there is no change to your score. Try playing a game to 21 points. The first one to reach 21 points wins the game, but you have to win by at least two. If this is too easy or too difficult, you can adjust the total points goal for the game in order to suit your needs. Not only will adding a scoring system to this drill help you to stay engaged, but it will also add an element of pressure which will put your stroke to the test. As a nice addition to this drill/game, you could add a short putt component when the long putts are finished. In other words, think about adding a second round that has you knocking in some putts from three or five feet. Between these two phases, your stroke should be well prepared for your next round. One of the biggest problems experienced by amateur golfers is the fact that their practice routines frequently do not represent what they are going to do out on the course. For example, you might spend hours on the practice green working on your stroke – but if that practice doesn't really replicate what you are going to face during your round, what good is it to you? By creating practice sessions that closely mimic the situations that you are going to see on the course, you should find that you wind up with greatly improved results. With that in mind, this last drill is going to help your putting tempo by placing you in a comfortable frame of mind prior to hitting each putt. During your next practice putting session, try hitting putts only after going through your full pre-putt routine just as you would do on the course. That means you aren't going to cut any corners at all – you are going to read the putt carefully from both sides, you are going to pick a line, you are going to visualize the roll to the hole, and then you are going to execute the stroke. Will this take longer than just walking up and hitting a few putts? Of course. However, speed is not the point when it comes to golf practice. Even if you only hit a handful of putts by going through this full routine, you will still get more benefit from your work than if you had fired off 100 quick putts without really paying attention to what you were doing. To make this drill as effective as possible, be sure to move around the putting green to give yourself as many different looks as possible. Position your ball so that you face downhill putts, uphill putts, and side hill putts throughout your practice session. By continually changing the kind of putt that you are facing, you will be able to put yourself to the test just as you will be tested out on the course. Also, since you are going through your full routine before each putt, you will be much more likely to maintain an even tempo in your stroke. It is easy to rush the stroke if you are just trying to fire off a bunch of practice putts in quick succession, so that kind of practice can actually harm your performance on the greens. By bringing your patience and working on your tempo on each roll, you should take a big step in the right direction. There is no doubt that tempo is a huge part of playing good golf, from making full swings down to rolling nice putts. Use the information included above to improve on the tempo that you use while putting and you should start to see the ball fall into the middle of the cup on a regular basis.